You’ll remember that Alpinist Magazine folded in October of 2008 after their business model came crashing down as the overall economy went in the tank. After apparently dumping over $2,000,000 into the magazine with no profits to speak of, investor Marc Ewing had had enough and the magazine’s assets were put up for sale. I mentioned in yesterday’s News & Notes rundown that Alpinist (and all its assets) was recently sold at auction for $71,000. 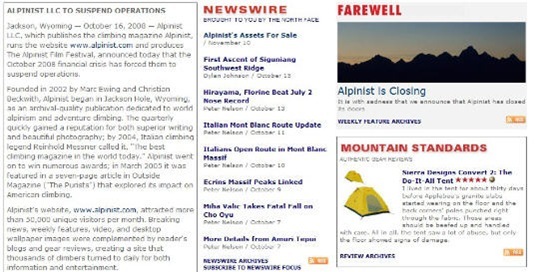 Alpinist, a 9,000-circulation quarterly about alpine-style mountain climbing which ceased publication in October, has been sold. According to a source, the six-year-old, high-gloss, high production-value magazine with a small but passionate community of climbers, was sold via a “live phone auction” for—wait for it—$71,000. That a magazine with a passionate fanbase and multiple (albeit not yet profitable) platforms is sold for less than six figures—and does so over the phone—is scary, and says more about the state of print than many publishers would care to admit. It is still to soon to get any sense of what the plans are for whatever is left of Alpinist. If past history is any indication, HOLP bought Coulier magazine in 2007 and simply folded it into their existing Backcountry publication. This seems unlikely to work with Alpinist as it was a fairly unique product, so it should be interesting to see what happens. if they covered only alpine bouldering and had issues only in the warm months, they’d own the market. it may have been a unique product, and it may have been the best (either within its niche or even outside its niche), but if that small passionate fanbase neither spends enough money to support the publication nor spends enough to show an increase in sales for advertisers, then its not a viable model. As such, its assets aren’t worth much of anything from a profitable business perspective. what ^^^^^ he ^^^^^ said. in my opinion this says nothing about the demise of print. instead, it speaks volumes about overspending on a product destined for the ‘uber-leet’ shelves of a few hundred people. for comparison someone should look at the print quality of Beanie Baby Magazine….. nevermind; it doesn’t exist. In my opinion, the dude over-paid. magazines about freezing to death after hoarding the last piece of chocolate bar while spooning with some skanky ball-sweat and foot stink smelling dood does not appeal to a large demographic. also, unless the magazine had real estate, printing machines, etc, it’s difficult to believe that the “assets” have much value. the subscription list could be replicated by some posts on rockclimbing.com and other sites that pander to the more foolish side of climbing. so, i agree with the above. all of the above. It should be very interesting to see what happens. I kinda don’t think climbing is a profitable industry. Yeah, I’ve noticed that pattern. It always seemed like a consequence of mostly appealing to older people who valued a physical copy and the obscene idea of treating it like a collectible comic book. Short one alpinist who is madly building museums of his own visions (Abominable Snowmen) nearly everyone else would have appreciated it just as much as an online outlet with no call to the general public to submit. Lets face the fact that without Patagucci catalogs to divulge his madness in any more Dean is probably only getting harder to decipher and proportionally more readable. Without having product to sell I suspect the authorship would offer more piercing looks into their thoughts than what their cheeseridden socks survived. Besides the stories in real time, it would have been able to escape the printers woe of finally telling the world what happened X months ago without uncovering anything new of any importance. Anyways, the real kicker would be the photography escaping the constriction of text and page size. Go find a full scale image from a professional DSLR or medium format camera online and I bet you tax your video card. Scary to the point of seeing the windburn in between every single whisker.